According to Locke's theory of the social contract, which was widely accepted by the Founders, political authority is limited by those natural moral rights that individuals reserve against the government. In this Article, I argue that Locke's theory generates paradoxical conclusions concerning the government's authority over civil disobedients, that is, people who resist the government because they believe it is violating reserved moral rights. If the government lacks the authority to compel the civil disobedient to abide by its laws, the result is anarchism: The limits on governmental authority are whatever each individual says they are. If the government has this authority, the result is authoritarianism: The limits on governmental authority are whatever the government says they are. Both conclusions are unacceptable. Because of the Lockean paradox, auxiliary constitutional rights, whose purpose is to protect civil disobedience, are likewise paradoxical. 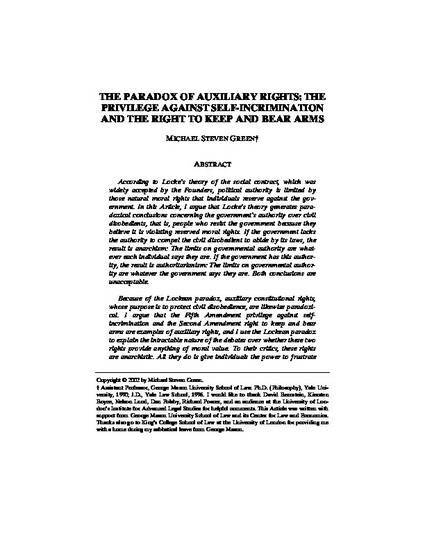 I argue that the Fifth Amendment privilege against self-incrimination and the Second Amendment right to keep and bear arms are examples of auxiliary rights, and I use the Lockean paradox to explain the intractable nature of the debates over whether these two rights provide anything of moral value.  To their critics, these rights are anarchistic. All they do is give individuals the power to frustrate the government's legitimate attempts to protect citizens against mutually-imposed risks of violence. To their supporters, these rights are a bulwark against authoritarianism. To deny citizens the power to resist the government is to accept that the only views about the limits of political authority that matter are the government's. These disagreements cannot be resolved, because both sides are right. Supporters of these rights are anarchistic and their critics are authoritarian. As long as we continue to accept the Founders' Lockean view that governmental authority is limited by reserved moral rights, we will never be able to reject or accept these two constitutional rights. The Lockean paradox also explains the difficulties that courts and academics have experienced delineating the scope of these rights in a conceptually satisfying manner. Here too I argue that these problems cannot be overcome. The limits that are placed on these rights will always be arbitrary and ad hoc.